Would you like a reading with the Tarot of Bones®? I have been practicing divination for over twenty years, and I offer several spreads with this deck of my creation. I can read for a specific situation or question, or I can do a general reading and see what comes up. Please read all the information on this page before buying a reading. To buy a reading, please go to the Tarot of Bones shop here. Five Classes Spread: This spread is based on the five classes of vertebrate–fish, amphibians, reptiles, birds and mammals. It’s especially good for coming-of-age experiences or other rites of passage where you’re reflecting on how far you’ve come. Due to my schedule, please allow up to a week for online readings. (I’m generally a lot quicker about getting the reading done!) The results will be emailed to the address your payment came from, unless you make other arrangements; if you would like to pay by check or money order or arrange an in-person reading, please contact me. Your reading will be kept entirely private. In the event I will be out of town or otherwise have notice of something that will delay your reading, I will contact you through the email address provided. If you are in or near Portland, OR or Long Beach, WA we can do an in-person reading; please contact me to schedule an appointment. I am also available for reading at events; please contact me for details. If you would like a monthly five-card reading (which can be done in person if you’re in Portland, or via email otherwise), you can sign up for the $20 package at my Patreon account. 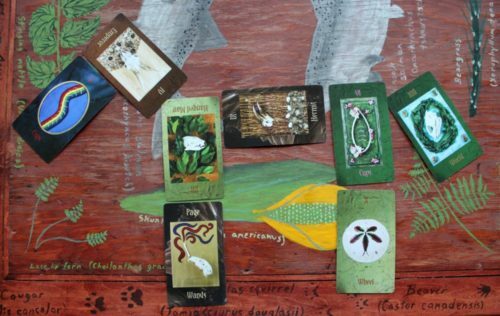 This is a 20% discount, since the five card reading is normally $25–and you still get access to other perks like the Patron-only feed and the monthly totem profile!